BURLINGTON (January 12, 2009) - Local artist Jason Bouwman is looking forward to seeing the new 2009 Special Edition Proof Silver Dollar which was released by the Royal Canadian Mint this past Friday. This is the second coin produced by the Mint to feature one of his designs. The principal of Burlington’s Compass Creative was commissioned to create the design which commemorates 100 years of powered flight in Canada. 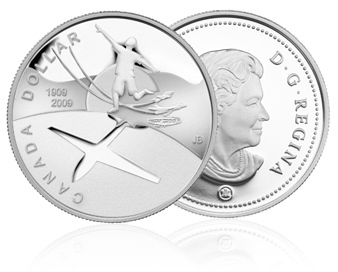 In keeping with the Royal Canadian Mint’s mandate to celebrate Canada’s values, history and culture, the design also includes three renowned Canadian aircraft: the Silver Dart, the Avro Arrow and the Snowbird. It will be 100 years ago next month that the Silver Dart, named for its silver silk-covered wings, lifted off the ice of Baddeck Bay, Nova Scotia to achieve the first controlled powered flight in Canadian history. A closer examination of the coin’s design will also reveal the form of a maple leaf ingeniously integrated into the image. The Silver Dollar is the newest addition to the Mint’s annual collector coin program and will be limited to a mintage of 50,000 for the proof version and 30,000 for the brilliant, uncirculated version. A limited edition with selective gold plating, highly anticipated by collectors, will also be available as part of the Mint’s 2009 Proof Set. For more information on where to purchase the coin please visit www.mint.ca.